London, UK – Popular Female DJ, Missy Jay, will be performing at the Park Plaza in London throughout March and April 2018. The dates continue her residency throughout the spring, providing individuals with an opportunity to see the award-winning Djette in action. The dates in March and April expand her monthly DJ sets that began in Sept. 2017. Her appearances were increased to bi-weekly in Jan. 2018 and she will perform at the Park Plaza on the following dates. * * Sat., March 17, from 12 noon-3 p.m.
* * Sat., March 24, from 12 noon-3 p.m.
* * Sat., April 7, from 12 noon-3 p.m.
* * Sat., April 14, from 12 noon-3 p.m.
* * Sat., April 21, from 8-11 p.m. The worldwide Park Plaza Hotels feature luxury at its best with 5-star ratings. The Hotels and Resorts are recognized for their specialty events featuring live musical entertainment from some of the most prominent DJs around the world. The internationally-recognized artist Missy Jay is a powerhouse performer rated by industry professionals as one of the Top 10 female DJs worldwide. She’s worked in radio and TV, owns her own music label and knows the music industry from both sides of the boards, allowing her to provide a truly unique performance that makes her a regular return artist by popular demand. Her Jayland Radio Show is broadcast professionally on five continents. 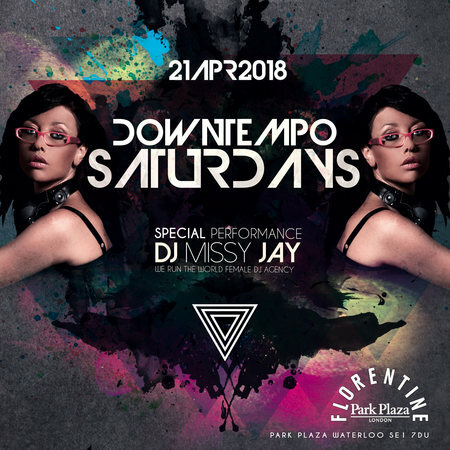 The upcoming Park Plaza performances by Missy Jay provide a treat for anyone who enjoys techno and downtempo house music. Missy Jay will also be performing on Sat. and Sun., April 28-29 at the Juice Plus+ convention in Birmingham, UK. Venue Details: Park Plaza, Waterloo, London SE1 7DU, United Kingdom.